Works on wood, plaster, concrete mortar. Digital LCD display shows moisture content as a percentage. Can also measure ambient temperatures. Batteries included. 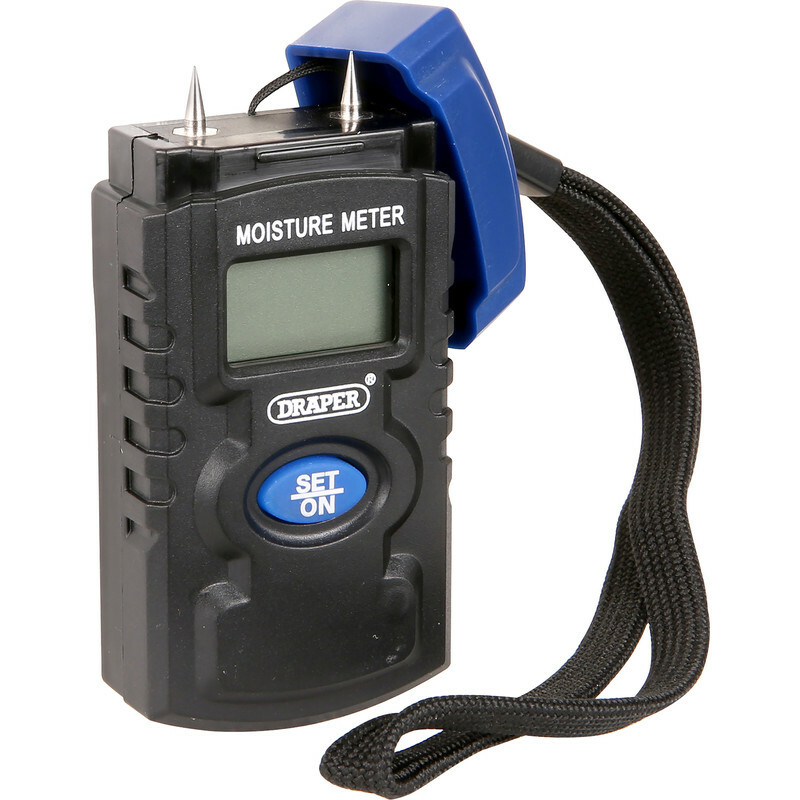 Draper Mini Moisture Meter is rated 3.1 out of 5 by 56. Rated 1 out of 5 by Dissatisfied 10 from Poor performance I didn’t believe other reviews as I thought Draper would not produce such a poor product. I was wrong. It either reads 0% or OL. Rated 1 out of 5 by Keith99 from Only good for firewood Disappointed. I bought it to complement my dehumidifier as I need to monitor the damp in a utility room before I replaster it. Only problem is, this is better suited to checking out firewood, as only when I unwrapped it did I discover it only goes up to 2% humidity, then says "OL" - presumably "Overlimit". When I'm dealing with levels of 50%, that's not much use. Rated 2 out of 5 by Ap5073 from Virtually useless! I bought this product to investigate a damp patch on a wall. I was unable to use it for the reasons below, and so it was returned for a full refund (thanks to Toolstation for their great customer service). The problems with the product are as follows: 1, the tethered cap actually prevents the product being used in tight locations, 2, when the product was actually used to take a reading, the reading was nearly always "OL"; nowhere in the instructions does it say exactly what "OL" actually means, 3, the reading disappears from the screen so fast, that in many cases it was impossible to read it, 4, the automatic shut down feature operated in far less than the specified 15 seconds, which often rendered the product unusable, 5, taking repeat readings resulted in wildly differing values. After obtaining a refund, I bought another product for just a few pounds more that worked perfectly. Rated 1 out of 5 by nothappy from Poor Battery were dead, needed to return it to store. Wasting time and money. Rated 1 out of 5 by Tewy from Useless Bought this a few weeks ago to monitor drying of leak damaged wall. Absolutely useless, typically stated OL and often resulted in no reading at all. Bow is in the bin where it belongs. Cheap and useless, do not buy. Bought another type online for a similar price and works well. Avoid the Draper meter. Rated 5 out of 5 by joes2 from small and handy works very well om wood!!! Rated 1 out of 5 by Fabio from Pretty useless The only moisture readings I was able to get from this product were either 'OL' (overload) or something too unrealistically low to be credible. Plus the moisture measurements changed each time I took them. One minute a piece of wood was 'OL', then 10-seconds later it was 0.5%. Inconsistent and not accurate enough to be able to rely on, which seems to reflect other reviewers' comments below (which I should've taken notice of before purchasing!) I took it back and was given a refund straight away, so at least the customer service from Toolstation was good - but the product is rubbish.